I just finished this today and I'm really excited! I already listed it in my etsy store and I hope to have more ready soon. 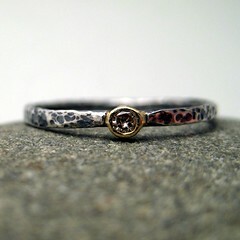 I want to do a series of gemstone 18k and sterling stacker rings in round and square ring shanks. My next project is to begin on the 18k chocolate diamond ring for the 7th Annual Chocolate Festival here in Wilmington!